We have worked with a Query to solve this problem earlier in the Blog Post: Percentage on Total Query. This time let us see how it is done on a Report. Our task is to show detail-line-wise value’s percentage on Report Summary Total. The solution is simple. Create a Report with some values in it with Report level summary. 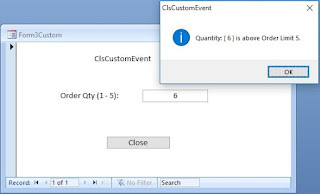 Add a Text Box in the detail section and write an expression to divide the Report Summary Value into the detail level value. Open a new Query in SQL View; without selecting a Table from the displayed list. Save the Query with the name OrderSummary. Design a Report (as shown in the image given below) with the Detail Section and Report Footer summary controls using OrderSummary as Source. Click on the Text Box at the Footer of the Report to select it. 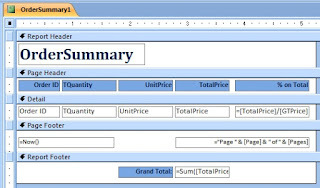 Display the Property Sheet (F4 or ALT+Enter) of the Text Box. Change the Name Property Value to GTPrice (stands for Grand Total Price). Write the expression =Sum([TotalPrice]) in the Control Source Property. Select the Text Box at the right end in the Detail Section and display its Property Sheet. Write the expression =[TotalPrice]/[GTPrice] in the Control Source Property. In the Format Property select the Percent format from the drop-down list. Type 2 in the Decimal Places Property. Open the OrderSummary in Print Preview and check the detail line percentage value calculated on Report Footer Grand Total Price. 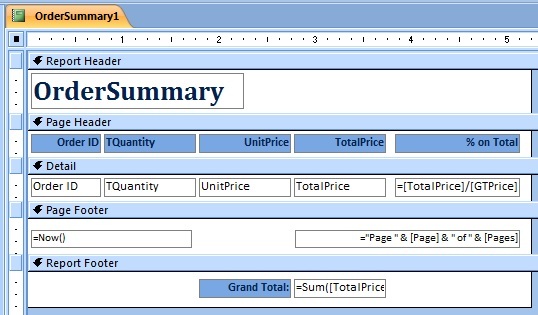 Want to know how to calculate and display Page-wise control totals; you can learn it from here?